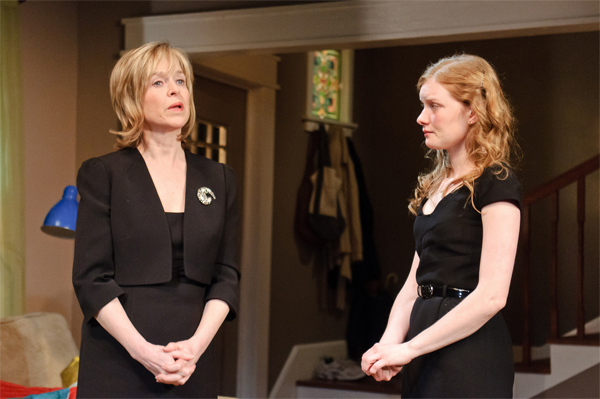 Bekah Brunstetter’s play about grieving disappoints. Loss, grief, sadness, and pain are all natural human reactions when confronted with the death of a beloved family member or friend. Bekah Brunstetter’s well-meaning but mostly uneven new play, Be A Good Little Widow, now playing at Ars Nova, attempts to weave together a story of two women who are on opposing ends of the grieving process. Living and playing house in Connecticut is Melody, a complacent young adult still searching for her direction or calling in life. Melody and her newlywed husband, Craig, have recently relocated so that Craig could take a new position at a legal firm and be closer to his widowed mother (ironically named Hope). Craig, played with tender care by Chad Hoeppner, is so equally in love with his new wife, his new house and his job that it is difficult to decipher which he values more. Although Craig does spend more time traveling for business more than he does at home. This leaves Melody at home color coordinating her sweaters, checking out a new yoga studio in town, or feverishly trying to decorate the cozy new starter home they reside in. When Craig suddenly dies in an unexpected plain crash, Melody and Hope’s worlds collide. Hope, an overbearing, overly critical, judgmental (really what is there to like about this women?) widower, herself, rushes to Melody’s side. It is remarkably clear though that Melody’s sporadic outbursts of emotion, hurt, and pain will not be tolerated by Hope. You see, when Craig’s father passed away, leaving Hope a single mother, she didn’t have time to grieve. “I got through it for Craig, because he needed me and I couldn’t be a wreck…” Hope tells Melody. Never allowing herself to properly grieve or feel has allowed Hope to create a tough exterior wall to avoid all emotion and even sent her to join a widow’s club where apparently one is taught the do’s and don’t’s of a proper widow. What creates further doubt is an unnecessary story line involving an affair between Melody and Craig’s coworker Brad. These one-dimensional characters all seem to speak in the same monochromatic tone. Oddly enough, looking around Daniel Zimmerman’s quaintly useful and effective set, or listening to Melody’s choice of music on her iPod, one would never peg Melody or Craig for being so monotonous. The throw pillows on the couch that Melody obsesses over are as plain and generic as the situations Brunsterrer contrives, which is why this play never really seems to go anywhere. The most interesting relationship that develops over the course of the play (which runs just under 90 minutes), and the heart of this story, I suppose, is the juxtaposition between Melody’s and Hope’s views of grief between and what these two women are able to teach each other. Wrenn Schmidt (Melody) and Jill Eikenberry (Hope) are both able to add substance, humanity and a sense of complexity to these unchallenging characters. It is true what they say; “absence makes the heart grow fonder.” Unfortunately, “they” (whoever they are) have already said it and Bekah Brunstetter hasn’t completely found a voice or characters to say or present it in any new way or form that is compelling.